Where is the America's Cup? It's taken less than two years fo go from the fantastic AC72 to the ghost of an AC62 to an AC48 - the smallest boat conceived to sail in an America's Cup in the 165 year-history of the event. The AC48 will clearly be cheaper in every way, but is it the America's Cup? 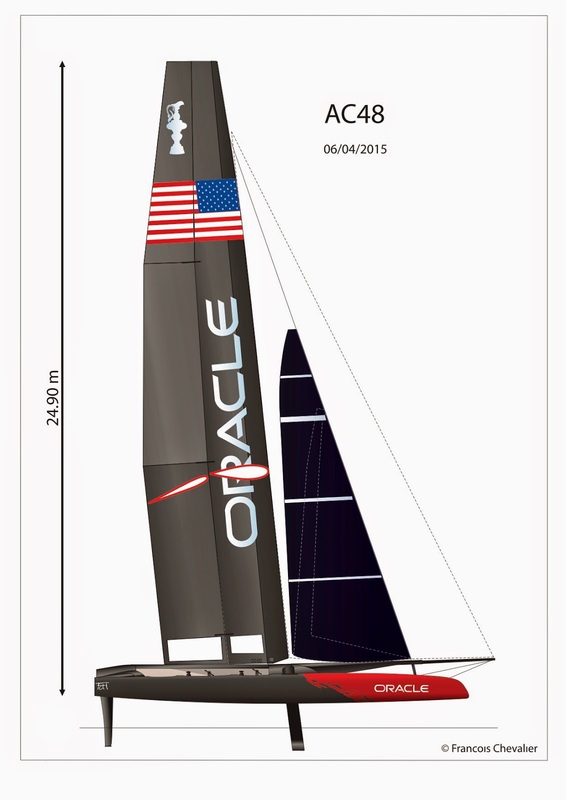 One might well doubt it in view of AC48 Rule version 1.0 March 31st - this is a one-design rule, and one that the Defender - Oracle Racing - has been thinking about for some time. 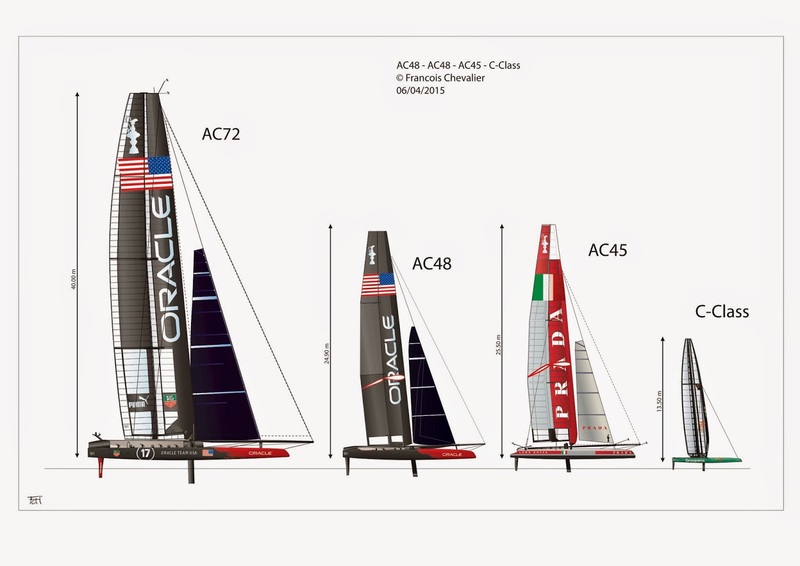 The drawing of the AC48 show that it won't even be as big visually as the AC45 (and the proportional drawing show even more that the AC48 looks like a 'special' brother to the AC45. What we have is a boat whose wing, sails, hulls, platform/crossbeams are standardized! Same engine, same body, all engineered by Oracle's designer. To reassure the world that the America's Cup still means something, the Rule throws engineers and computer scientists a bone; they have a small amount of freedom to design the daggerboard/lifting foils, the rudders, non-structural aero fairings, and some parts of the wing and board control system. In other words, history showed us what the America's Cup is, and we all know of the Little America's Cup, so then this new AC-1D-48 should probably be called the Medium America's Cup. Looking at the design drawings, you will see that the new boat is no longer visually special, and will probably be overlooked amongst the already large and growing number of multihull racing events. Only the name of the trophy will maintain whatever legend remains. Hence the Medium Cup! 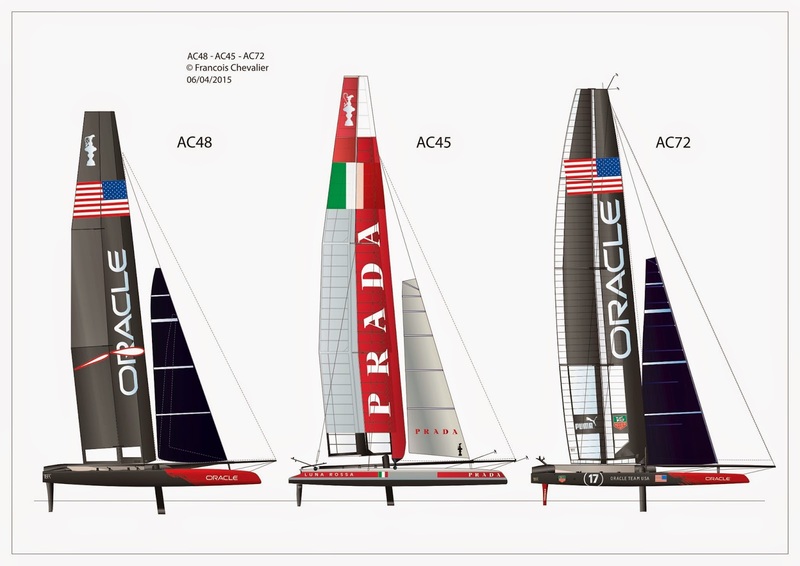 As a result of AC organizers' wholesale changes, the Little America's Cup (now called the Little Cup thanks to trademark claims by the AC organizers) raced with C-Class cats becomes the sole remaining event in which the inventiveness of yacht designers is still free. The sole constraints in the C-Class: Length, width and sail area. Let us say straight away: Vive the Little Cup! Vous avez dit America’s Cup ? C’est acté : depuis le 31 mars 2015, la nouvelle jauge de l’America’s Cup est adoptée, approuvée à la majorité (et non à l’unanimité) des challengers membres de la commission de la Cup. En moins de deux ans, nous sommes passés du fantastique AC72 – le catamaran volant pourtant décrié à tort par les traditionalistes – à un fantomatique AC62… pour enfin aboutir à un AC48. 14,65 mètres de long ! On a jamais imaginé si petit dans cette fabuleuse histoire depuis 1851... Il sera certes plus économique à construire, plus facile à expédier, et aura moins d’équipiers. Dans le contexte d’une épreuve aussi mythique, « small » est-il vraiment « beautiful » ? À voir ! Le quasi-monotype AC48 sous les couleurs d'Oracle, le concepteur : tout est dit ! Au-delà de la réaction typique du « râleur » de base, il faut se souvenir que la Cup a été pour les architectes et concepteurs, depuis l’origine, une formidable machine à rêver, à innover, à créer. devront être standardisés… Même moteur, même carrosserie conçus par l’architecte d’Oracle ! Reste que l’épreuve reine de la voile sera noyée dans la masse des circuits de multicoques. Seul le pichet remis au vainqueur entretiendra la légende… Une Medium Cup, donc. Vive la Petite Coupe !!! Du coup, l’ex-Little America’s Cup (ex-petite Coupe de l’America) désormais appelée Little Cup (Petite Coupe), disputée en C-Class (Classe C) devient l’unique compétition où l’inventivité des architectes navals, des innovateurs, des créateurs est ouverte. Seules contraintes : la longueur, la largeur et la surface de voilure sont de mise. Autant le dire tout de suite : vive la Litte Cup !